A pastor has unearthed a whopping 706-carat diamond in a mine in eastern Sierra Leone — possibly the tenth largest stone ever found according to experts. The massive diamond was extracted by pastor Emmanuel Momoh, a self-employed and registered artisanal miner, as he worked in the mines in the diamond-rich Kono region. Under the law, Momoh is entitled to all but 4 percent of the proceeds of a future sale of the rock, which the government claims for valuation and export. The massive stone has yet to be valued but is expected to be worth millions. A US-based diamond expert Paul Zimnisky told AFP that once the gem's quality was assessed it could rank "between the 10th and 15th largest gem-diamonds ever recovered." 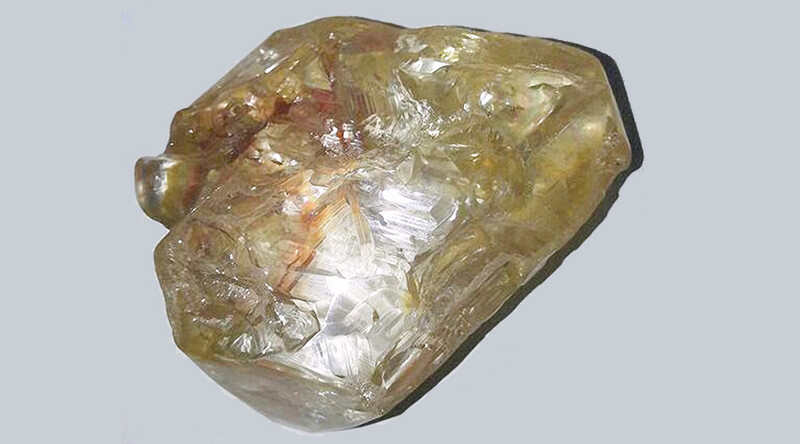 Breaking News: 706 carats of diamond found in eastern #SierraLeone district of Kono, the biggest since February 1971. Caratage of biggest diamond found in #SierraLeone in nearly 50 years revised to 709.3 from 706, says PC Paul Saquee. The diamond was presented to President Ernest Bai Koroma Wednesday evening before being locked in Freetown's central bank vault where it awaits official valuation under the Kimberley Process, which certifies diamonds as "conflict-free". The president thanked the chief of the Tankoro area where the stone was found for not smuggling it out of the country. Koroma emphasised the importance of selling the diamond in Sierra Leone and assured the country that the selling process would be transparent and the diamond would be sold to the highest bidder. Mines Minister Minkailu Mansaray told AFP the government's stake would be used to fund development projects nationwide. Some locals in the region are skeptical, however, about how they will reap the benefits from the incredible find, according to AFP. "Previous diamonds have not benefited the people and I wonder how this new diamond will make a difference," Jeneba Kallon, a civil servant, said. Sierra Leone’s decade-long civil war was fuelled by trade in the so-called “blood diamonds” resulting in more than 120,000 deaths and huge social and economic costs to the nation. Up until now, the title of the tenth largest diamond has been held by the ‘Jonker’ discovered in South Africa in 1934. A polished stone cut from the diamond will go on sale in Hong Kong in May and is expected to fetch up to $3.6 million for a single 25-carat portion, according to Zimnisky. In 2015, a 1,111-carat diamond was discovered at a mine in Botswana — the biggest find in more than a century, coming second to the famous 3,106 carat Cullinan diamond.